Should You Get Married on Ambergris Caye? Planning a wedding can be a lot of fun, but it is also a serious project that many couples find overwhelming. One of the toughest decisions you will make about your big day is where it should be held. For many engaged couples, nothing could be better than exchanging vows surrounding by beaches, warmth and tropical nature, but each person has to make this decision for themselves. Here are some key questions to answer in order to find out whether you should get married on Ambergris Caye, Belize. Most people will answer this question with an enthusiastic "yes", but it is important that you really do enjoy warm weather if you plan to get married in a tropical destination like Belize. Throughout the year, the island of Ambergris Caye boasts warm temperatures, which means that swimming in the ocean or kicking back by the pool are all real possibilities whether you get married in January or July. If you are hoping for a winter wonderland, however, Belize may not be the right place. Although there is the potential to hold your wedding ceremony and reception indoors, many couples embrace the idea of celebrating outdoors in the scenic beauty of the island. If you have always dreamed of exchanging wedding vows under a blue sky, surrounded by white-sand beaches or on a manicured green garden edged with colorful flowers, then a wedding on Ambergris Caye could be your dream come true. One of the many wonderful things about having a wedding in a tropical destination is that you can have greater control over the number of guests in attendance. Flying to a new destination helps ensure that those in attendance truly want to be there to celebrate with you, but the close location of Belize means that the journey from North America is still very short. Whether you are interested in a private ceremony on the beach or a wild celebration with 100 of your closest friends and family members, Ambergris Caye and places like the Exotic Caye Beach Resort can cater to those needs. Is Cost a Big Factor? 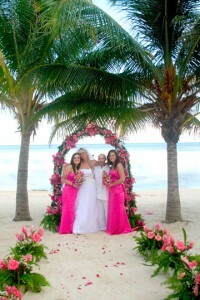 Many people are under the incorrect assumption that tropical weddings are very expensive. Since you will have fewer guests attending, however, destination weddings can often be much cheaper, especially when you pick a low-cost island like Ambergris Caye in Belize. Affordable accommodation and marriage licenses that cost just $100 make Belize weddings more inexpensive than you might expect. Click here if you are serious about getting married in a stunning tropical location like the island of Ambergris Caye, Belize.